The Revd Rana Youab Khan is an Anglican born and brought up in Pakistan. Rana Khan have been involved with inter faith relations as well as justice and peace activities and prison ministry in Pakistan for many years. Although he comes from a Christian family, however was educated in a madrasa (primary school) attached to a Mosque in Vehari, Pakistan. He served as advisor to the Bishop of Lahore on Inter Religious Relations. A lecturer in the Hebrew language at the Oriental College, University of Punjab, and was the first (Indian-Pakistani) ordained priest appointed to the faculty of the University of Punjab since its foundation in 1870. 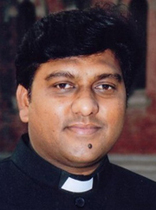 Revd Rana worked as the International Inter Faith Dialogues Assistant to the Archbishop of Canterbury and the Anglican Communion. He regularly writes on various issues related to interfaith, intercultural theology and persecuted religious minorities.